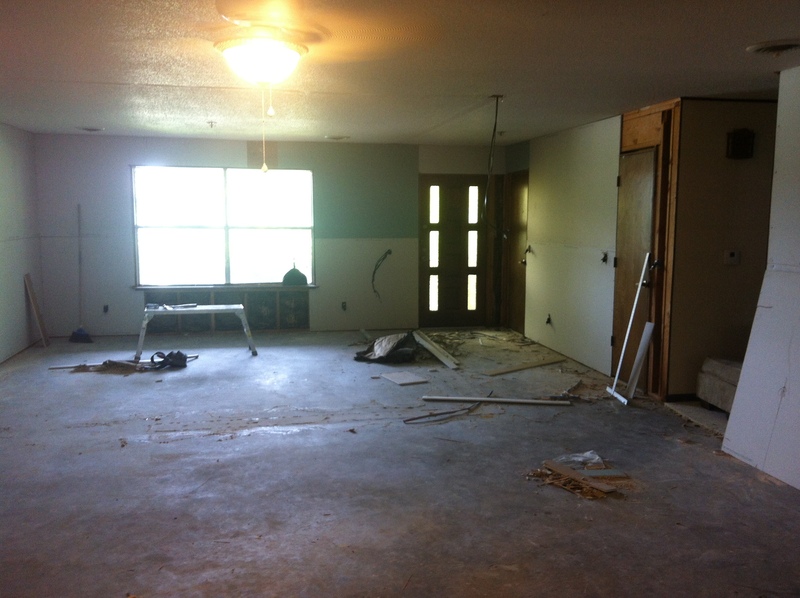 Way back to Flip 1, I had no idea I was going to flip a house. I just knew it was all I could afford. While I didn’t like the finishes, or “design,” and it needed some deep cleaning & updates, I knew it had potential. So I dove head first into buying a foreclosed fixer upper…without realizing that I was going to be living in a construction zone. Fast forward many years later, and I’ve lived in more construction zones than I actually have finished homes. Admittedly it’s not my favorite thing to do, but the temporary inconvenience proved worth it time and time again. I’m not going to lie- it’s annoying, it’s dirty, it’s frustrating, it’s exhausting, it’s draining. It’s all of those things. But I hope this post about what it’s really like living in a construction zone is helpful and motivates you to tackle a live-in fixer upper! When I started on Flip 1, it took allll my money just to afford the down payment. After the down payment, I was flat broke and making $24,000/year (GROSS not yet!). I had no money to buy a new sink, replace the floors, or even buy the paint. But I quickly learned, I could demo a house for free! So I spent my weekends and nights ripping up the burnt carpet, peeling off the hideous wallpaper, scraping the filthy popcorn ceilings, hauling off the non-working appliances and anything else I could tackle myself. And after a couple months, I officially had a construction zone on my hands. No matter how hard I tried, dust was E.V.E.R.Y.W.H.E.R.E. I found dust on my clothes, dust in the dishwasher, dust on my sheets. It creeps into every big and little spot and it seems to multiply like rabbits. I would sweep and vacuum…sweep and vacuum…and even mop. And still the dust was everywhere. 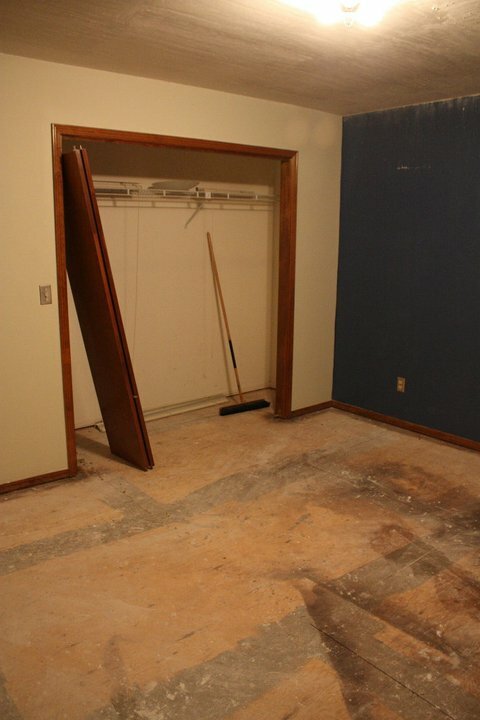 At the time, I was living on subfloors- I had no money to add new flooring. So I was never able to walk barefoot through the house. I would wear flip flops everywhere- even in shower! In addition to the dust, there was legitimate grime everywhere. Since I bought a foreclosure, I expected it to be dirty. The non-working stove was covered in grease and other foreign, unknown elements. The popcorn ceilings were caked in layers brown dirt. The windows had a haze over them because they hadn’t been cleaned for years. The carpet had been burnt and decayed carpet fragments were all over the house. The bricks on the fireplace looked black because they were so filthy. It’s hard to sign-on for those living conditions, but, it made me a very OCD cleaner. 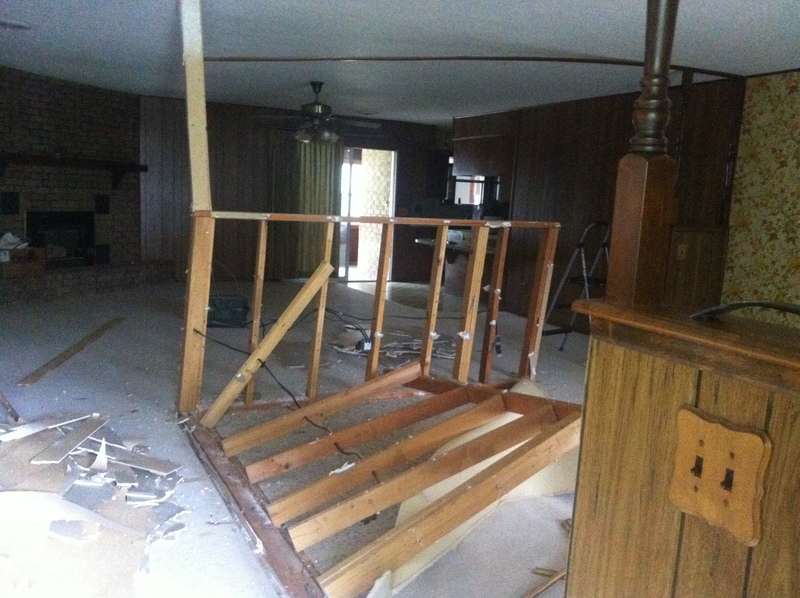 If you enjoy quiet weekends lounging on the couch watching Hallmark movies, live-in flips are probably not for you. To state the obvious, I didn’t (and still don’t) have cable. I didn’t even own a TV for most of the time I lived at Flip 1. 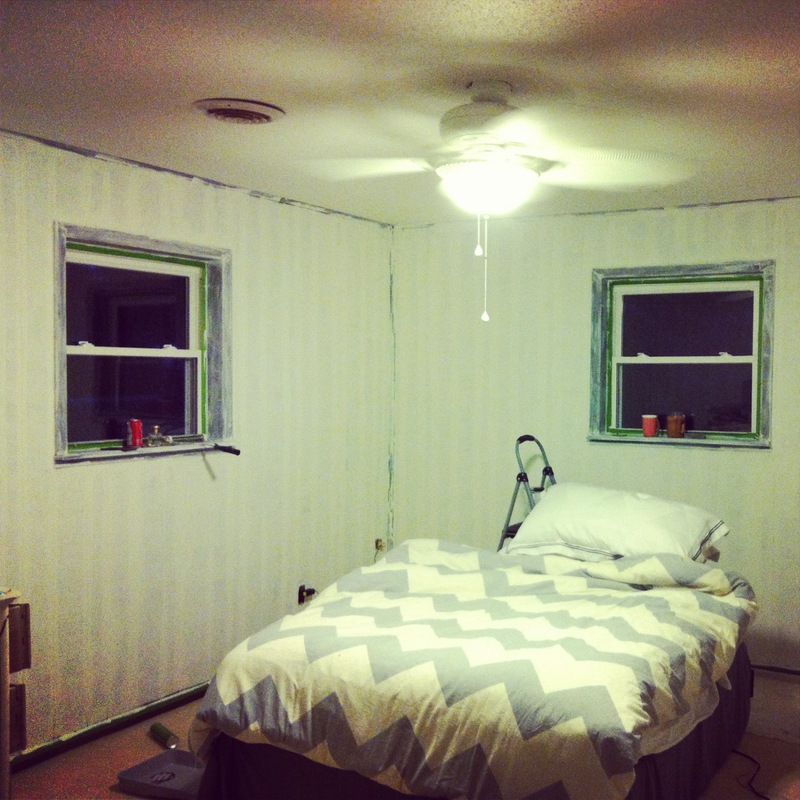 So my spare time was spent painting, ripping up carpet, busting out walls, etc. The dining room “cage” at Flip 2 took me a couple days to fully remove. In the meantime I was stepping over piles of ripped sheetrock, 2x4s, paneling, nails, and more dust. While this project was going on, the power was turned off to that portion of the house. I had no light in the kitchen to cook, no light in the living room, no exterior light by the front door. Like I said, it’s inconvenient. The levels of inconvenience vary. Sometimes it’s just dealing with dust everywhere. Sometimes it’s only using paper plates that can be disposed because you can’t wash them. Sometimes it’s using an ice-chest as a makeshift fridge because you don’t have one. Maybe it’s eating fast food for a lot of meals because you don’t have a stove. Maybe it’s making sure you’re awake for the contractors that show up at 7am to start their work. There are just so many different types of inconveniences when you live in a construction zone. If you hate to be inconvenienced, this is certainly not the life for you. There’s a reason why they say home is where you go to relax. But what if your home is a construction zone? I assure you, there is no relaxing in a construction zone. After working long days (because at the time of Flip 1 and Flip 2 I was working multiple jobs), you want to come home and relax. 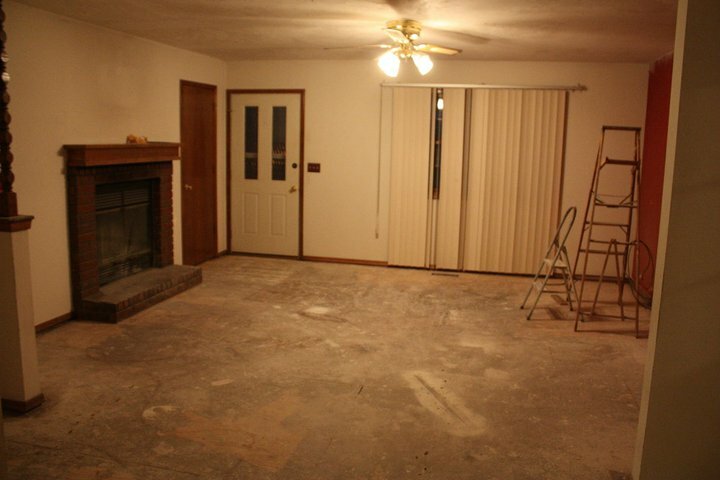 But I had no furniture. No couch. No chair. No table. I had my bed- that’s it. And sometimes all of the chaos just hits you- just want a normal home. You want to curl up on the couch with take-out and watch movies. Instead, you eat another dinner out of a sack, while sitting in your bed- with no TV to watch. There were many times I felt like I was on the verge of an emotional breakdown- especially after a contractor completely screwed up and cost me thousands of dollars. I had many moments of tears, curse words, and just throwing my hands up. BUT- things always got better. Even in the worst trying moments, it never was terrible forever. In fact, each house made me money, taught me lessons, and helped me reach my goals. During the demo and construction phase of each house, I basically live out of my suitcase. I keep everything boxed up and stored in the garage. And when you’re forced to live with the bare essentials, you quickly appreciate and adapt to the minimalist lifestyle. And if you take the method I did of moving every two years, that minimalist life makes it so much easier. Once I got beyond the full demo phase, I would move in my bed- nothing else. No bedside table. No chairs. Just a bed. I quickly learned the less I have, the less I have to protect from dust and damage. I can promise you it won’t be easy. It won’t be fun. But it might just be worth it. Whether your goal is to create a lifelong home you’ll love or to build equity and sell it, buying a fixer upper can be a smart choice. For me, this unusual lifestyle allowed me to pay off $70,000 in student loan debt. It has provided me with a new career. It’s truly changed my life. So all those nights of literally having to pull back the plastic cacoon on my bed to sleep were worth it. All those hours spent cleaning dust off everything were worth it. Even the Tetanus shot I had to get because I stepped on a nail was worth it. This is the only lifestyle I know, and much to the chagrin of outsiders, I don’t see myself ever not living this lifestyle. It’s just been too lucrative and beneficial to me. And the same could be true for everyone– if you can stomach living in a construction zone! Flipping was on my bucket list but I’ve only done 3. Flip #1 I inherited from my aunt but after her death, the city condemned it for foundation issues. That repair was pricey but necessary or the house could not be sold, so I quite reluctantly got a bank loan to get that done. That was SCARY! The rest, however, was simple – lots of patching and painting mainly, and my dad helped me a LOT which kept costs down. Five months later I sold it, repaid the loan, paid my dad and banked the rest. Ten years later, after remarrying and moving to another city, I found flip #2 . The school secretary had been trying unsuccessfully for over a year to sell her dad’s house, and boy, oh boy, it was a real challenge. The smell was absolutely eye-watering and gut wrenching. Hard to decide which was worse, the lingering smell of cigarette smoke on everything, along with nicotine stained walls, ceilings and window panes or the bedroom’s urine stained carpet ! 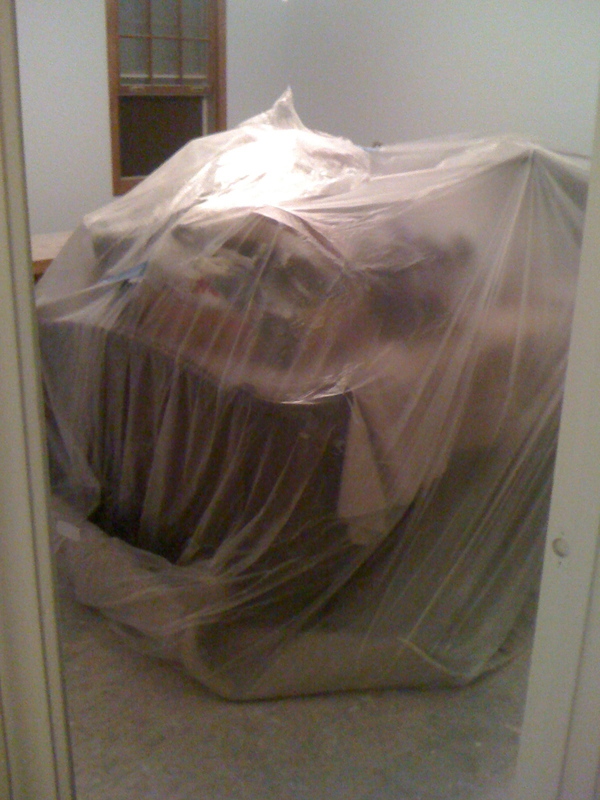 Even the man I hired to remove the drapes, the carpet and linoleum gagged! ONLY because the place was so unbelievably underpriced did I buy it. Would I do it again – with one in that condition? NOPE! Unexpected plumbing and electrical issues to bring the house up to code ended up costing a lot, so I didn’t realize the profit I hoped to earn, but on the other hand, I did learn valuable lessons which paid off handsomely with flip #3, found by my son the following year, which, despite being an abandoned bank repo, was ugly but in good mechanical shape. (By then I knew what pitfalls to look for!) I said bye bye to outdated wallpaper and shag carpet and hello to neutral walls, freshly painted cabinets and laminate flooring! Five weeks of hard physical labor after regular work hours and lots of sweat equity helped me decide 3 was enough, despite the quick sale, so house flipping is no longer on my bucket list! If you have the time and energy, flipping can be a great way to make money. I am retired and now have the time, but lack the motivation and physical energy. You’ve been an inspiration and I loved reading about each and every one of your flips. You have talent and determination to meet and conquer those unexpected challenges – including actually living in a construction zone for weeks and months on end. You are awesome. I’m eager to see how the AirBnB studio evolves! Susan you are exactly right! The motivation and physical energy dwindle with each flip. It’s so taxing to do them! And sometimes the profit is worth it– sometimes not! The older I get the more I like the idea of less taxing forms of income! Not to say I won’t flip again- because I know I will. But maybe not at the same intensity! And there are certainly houses that I’ve flipped that I wouldn’t tackle in the future! I commend you for this blog. You are actually giving a first-hand account of what flippers tackle on a daily basis, which is good for the newbies. It is really emotionally taxing job, but it does teach you a lot about the markets, interior décor, building contacts etc. which helps in the long run. I was happy to read how you managed to pay your student debt through this; well-deserved success. Thank you so much for your comment! It definitely is emotionally taxing!